» Time to enjoy eh! » Old birds May 4th start. » 2019 RPRA One Loft Update. Pigeon World Syndicate Bird takes 81st Place in the 2017 Final Race, The Bird is Dia Evans Bloodlines and was Bred and supplied by Tumley Lofts Stud. 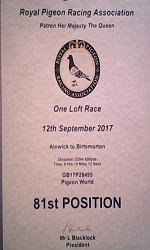 Pigeon World Forum Syndicate take 81st Place in the 2017 R.P.R.A. Final, with a Pigeon Bred and Supplied by Tumley Lofts Stud. 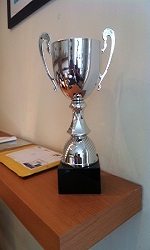 Pigeon World Forum, Fancier of the Year Trophy. Oldstrain/Darren`s Winner of winners. 2012. The N.E.H.U race from Melton Mowbray 21/4/2012 was won by Peel bros of South Shields, they took 1st club 1st fed, also taking 2nd and 4th club and 15 of the 25 birds clocked in the club......well done Peel brothers. John Gibbs young pied/grizzle winner. Jump to: Select a forum||--Message Forum| |--Rules of the Forum| |--Forum One Loft Syndicate 2018| |--R.P.R.A. Oneloft Syndicate 2017.| |--Young bird exchange.| |--2011 YB Auction.| |--Online Shows......| |--Introductions & Members Messages.| |--General Discussions| |--Help and Info.| |--Live Nestcam.....| |--Ideas and Theories| |--Novices and Beginners| |--Articles| |--Watchfield Writings.| |--Health and Feeding| |--Breeding,strains and families.| |--Fancy and Show Pigeons| |--Non pigeon Chat| |--pigeons.forumotion test-loft| |--Site Syndicate.| |--2010 YB Auction.| |--Fut. 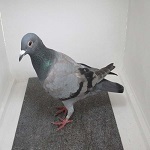 youngbird race.| |--Test Loft 2013| |--Blank Forum| |--Blank Category| |--General Pigeon News| |--Latest Pigeon News| |--Weather| |--Race Results| |--Lost and Found| |--Lost Pigeons| |--Found Pigeons| |--For Sale Section| |--For Sale/Free.| |--Items Wanted| |--Photo Album| |--Post your photos here| |--Post videos here| |--Pigeon Site Links. |--Taylors Choice. |--Pigeon Sales |--R.P.R.A. Website. |--Louella |--Bricon. |--Cosworth stud feeds. |--Norban, on-line shop.